Punch out insides of MDF shapes. Paint each shapes with gold and/ or silver paint. Trace around the centre piece of each shape onto the back of the paper, then cut with FISKARS comfort grip craft knife or FISKARS micro tip scissors. Using a good adhesive stick the paper pieces onto the insides of your shapes. Put the shapes back together. Paint each piece with Modge Podge sealer particularly the paper to preserve it. Using your FISKARS 12” Trimmer and your scoring blade cut three 2” x 5” pieces of metal shim and one 3” x 7”. 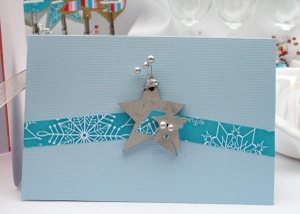 Using your FISKARS Scrapboss emboss stars or other Christmas designs onto you metal shim. 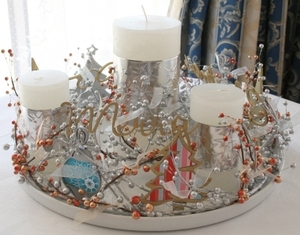 Then wrap the metal shim around your candles. Place candles on your cake plate, three smaller around the outside and one larger directly in the middle. Arrange bead garlands around the outside candles. Place your large MDF pieces around the outer edge of the plate and wind some of the garland wire around the pieces to hold in place. Add some tape if you need to secure them more. Add another row of garland inside the first one, around the large candle and wire the Merry Christmas 2007 words to it. Use some tape to help hold the pieces in place if need be. To finish off tie some pieces of ribbon in knots to sections of the garland. Punch out insides of MDF shapes. 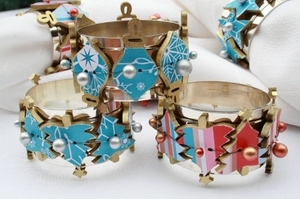 Paint each shape with gold and/ or silver paint. Trace around the centre piece of each shape onto the back of the paper, then cut with Fiskars comfort grip craft knife or micro tip scissors. Clip shapes into your photo clip. Paint largest tree shape with silver paint. 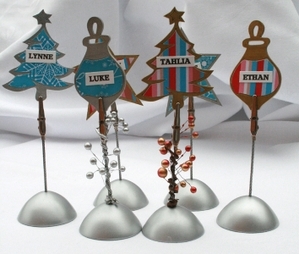 Trace around all tree shapes onto paper and cut out using FISKARS micro tip scissors or soft grip craft knife. Cut out two trees in each paper. 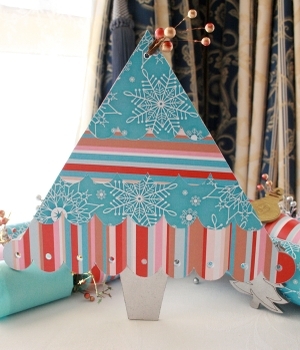 Using FISKARS anywhere hole punch, punch holes in the bottom and top of the largest paper tree shape corresponding with the holes in the chipboard. Stick papers onto the largest tree shape starting with the biggest and working down to the smallest. Turn tree over and trim off any overhanging papers with your FISKARS soft grip craft knife. 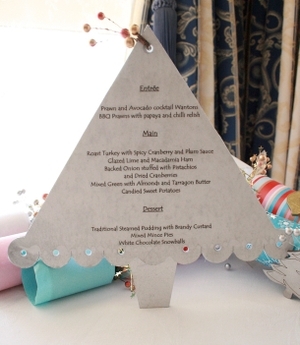 Print Menu onto velum and stick to the silver side of the tree. Stick paper onto cardstock then velum on top of that. 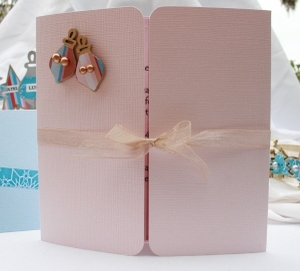 Using your FISKARS anywhere hole punch, punch holes in the velum through the holes in the chipboard. Break off some wire and beads from your garland and wrap around the tree top through the hole. Paint all button shapes with gold and/ or silver paint. Trace around each shape onto the back of the paper, then cut with Fiskars comfort grip craft knife or micro tip scissors. Using a good adhesive, stick on the paper pieces to the insides of your shapes. Put the shapes back together. 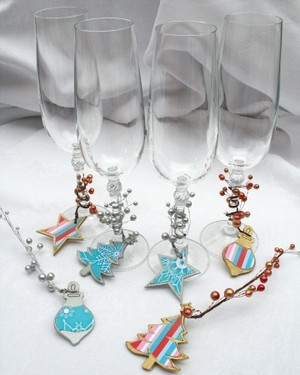 Break off one section of your garland then pull out an individual wired bead and thread through the holes in the shape. Wire each piece together tightly. Attach the completed section to a napkin ring. the scoring blade score at 4” . 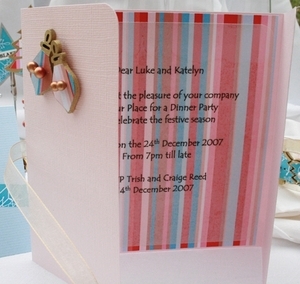 Print your invitation message onto piece of velum. Then trim to 3 ¾ “ x 5 ¾ “. 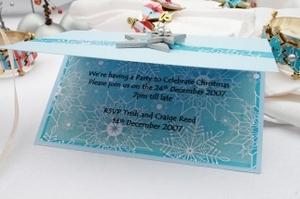 Cut piece of paper to 6” x 4” and stick inside the invitation, then stick the velum piece on top. 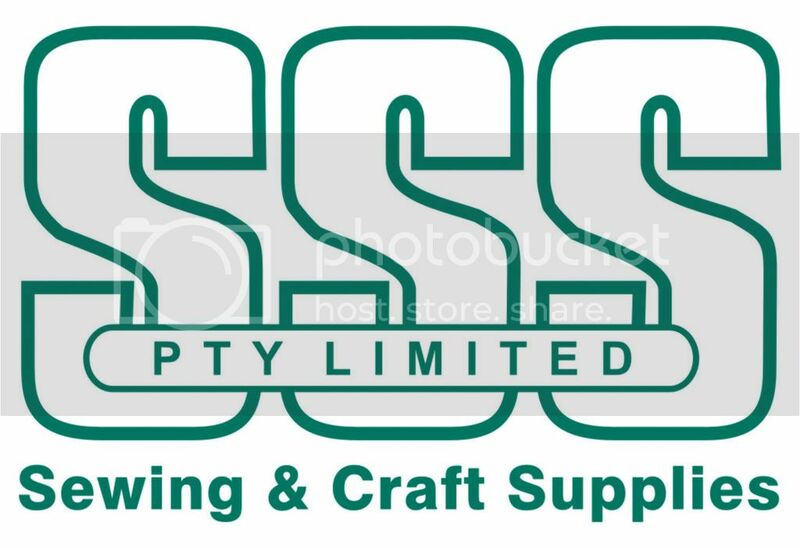 of your card at the end of the paper strip. MDF shape a little bit and slightly angled. Stick on the smaller MDF shape on top of the larger one over the paper strip a little.